New York State Lt. Gov. 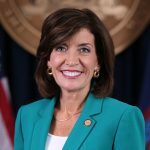 Kathy Hochul has served at every level of government and uses her current platform — as the highest female elected official in state government — to advocate for women leaders in all types of organizations. On Nov. 27, Hochul came to the University at Buffalo School of Management as part of the Leaders on Leadership Speaker Series hosted by the Center for Leadership and Organizational Effectiveness. In a Q&A led by Paul Tesluk, dean of the School of Management, she discussed why we need more women in leadership roles, and how organizations, government, and men and women alike can encourage and develop women leaders. The following is an excerpt of Hochul’s presentation. PT: Why do you believe it’s so important to advocate for women leaders? KH: We are harmed in all of our institutions — the private sector, public sector, nonprofits, education, the tech space and certainly my world — by not having equal representation of women at the table. This is a turning point in our history. I believe we have to do more to get women into the corridors of power because we just bring a different approach to leadership — a collaborative spirit, a listening disposition. I saw the difference firsthand in Congress with something as simple as softball. (Hochul participated in the Congressional Women’s Softball Game, when female members of Congress play the Washington Press Corps for charity.) We practiced together — Democrats and Republicans, House and Senate, on the same team. We were out there with no makeup on, in our sweats, and we developed relationships and friendships across the aisle. Contrast that to the men — Republicans and Democrats practice across town from one another [on opposing teams.] By choice, they never have the opportunity to build relationships, and when they have their big charity game, it’s Democrats versus Republications playing where the Washington Nationals play. It’s like watching gladiators. That’s just an extreme example of how we approach the same opportunity differently — raising money for charity through sport. How can we promote more women into leadership positions in politics, business and other areas? I think there’s been an awakening, which is a start. With a lot of the sexual harassment and assault cases coming out, it shows there’s an imbalance of power. Just having women in those [leadership] positions creates a different workplace. But until they’re there, men in those positions have a tremendous opportunity to open doors for women. One reason: It’s the right thing to do; it’s about fairness. There are so many ways to say, ‘Yes, I’ll mentor you,’ ‘I can help you,’ and women need to do that as well. In the private sector, one area you can take care of is wage disparity. Stop asking what women made [in past positions] because women will invariably be held back for making less than a man, whether fairly or unfairly. A woman may take time off to raise children, so her salary doesn’t catch up. That’s why women over their lifetime will have $500,000 less in their pensions than men for doing the same work. Don’t ask what she made; put a value on that job and say she’s entitled to that amount because she’s had other experiences. Another area where women need more encouragement is in tech startups: The number of women in tech is so low. Women have always had to be better than men to do any job, so there’s this fear of failure — she won’t reach for a job where she’s not the best on her résumé, or 10 times better. In the startup space, failure is expected. There are huge investors in Silicon Valley who will not invest in someone until they’ve failed three or four times. Are they going to cut slack for women who’ve failed four times? And are women willing to stick with it because the fifth time’s the charm? That’s something you need to talk about in classrooms, to let women know the culture requires risk-taking and that failure is OK. I also believe leaders demonstrate confidence in themselves — it’s not arrogance, but a quiet sense of confidence. Women don’t always inherently have that, and I see that in politics a lot. But that’s easy to change. You may not be able to change culture or society, but you can change what’s in your own head if a lack of confidence is holding you back. Practice walking into a room like you own the place. I said that to my 15-year-old niece, who was my intern for a couple weeks: “Dress up, carry a briefcase, walk into that room like you own it and start acting like you’re in charge.” By the time I was done with her, people thought she worked for the governor. You can change. You have to lean into it. With the softball example, you talked about the importance of gaining new perspective. Are there other things leaders can do to reduce contentiousness and bring people together? I’m a firm believer in bringing opposing parties into a room and saying, “We need to work this out. Don’t you think we can meet in the middle?” It’s just about human relations, and doing that one-on-one is a skill. Often, women don’t appreciate skills they’ve acquired through life. If you have teenagers, don’t you think you can handle any conflict? The organizational skill of managing a household is transferable to managing an organization. Women have a fortitude and toughness that may not show up on a résumé, but boy, don’t test us. But women also need to adapt. In a male-dominated world, you have to get along, to a certain point, to get elevated up. You can’t break down barriers without understanding the culture you’re stepping into. When I got into the elevator on Capitol Hill, the guys would all be talking sports, and I can talk sports. I’d say, ‘The Bills are going to win the Super Bowl,’ and that always got a laugh. You need guys on your team. The reality is men hold the keys to a lot of power. They need to be willing to unlock that door and then treat women fairly and equally once they’re in there. You come from a family of entrepreneurs. From a leadership standpoint, how do you see the skillset overlap between politics and business? I think businesswomen would be brilliant in politics — absolutely brilliant. They understand the needs of a workforce, child care needs and what health care does. Business is all about risk. You need to embrace risk if you want to start your own company and be willing to fail. That really helps me in politics, never fearing failure. I’m not afraid to fail at anything because I know I’ll always get up. Imagine the worst that can happen in anything you do, and then you can do anything because you’ve already figured it out. What’s the worst that can happen? You run for Congress and lose — will you still be alive the next day? Yes, so what’s the problem? That’s how I frame my life and that allows me the freedom to take on new challenges. This entry was posted in Leadership and tagged gender equity, leadership by UB School of Management. Bookmark the permalink.